The King of Swords tarot card shows a king who sits on his throne while holding a double-edged sword that points upwards in his right hand. The King of Swords radiates intellectual power, clear thinking, truth, and authority. He understands that power holds great responsibility. The blue tunic that the king wears is a symbol of his spiritual understanding. The butterflies on the back of his throne are indicative of transformation. The King of Swords appearing in a reading suggests that you should remain objective in your current situation - you must establish truth by sticking to the facts. The King of Swords and his intellectual power implies that you will need to use your intellect to make your point known and attain your goals. Besides your experience and education, you should be sharp and observant, to see deeply into problems that come your way. Because he rules over the suit of swords, he has a special connection to rules, laws, and diplomacy, which are systems of logical thought applied and manifest on earth. The King of Swords meaning also shows that you need to be stern in your role while ensuring that you have clarity of mind at all times. When judging a situation, you need to consider all the possible consequences to make an appropriate judgment. You will need to leave your emotions out of the judgment so as to maintain rational thinking at all times. The King of Swords meaning suggests that you should take time to reason with others and be candid with the observations that you have made. As far as your personal life goes, the King of Swords urges you to use your intellect and logic to maneuver the path that lies ahead. You will need to confront the issue at hand and make a sober decision. The King of Swords implies that you should be able to look at any situation and make a decision with complete impartiality. He can also be an indicator of the high ethical standards that the King of Swords demonstrates. 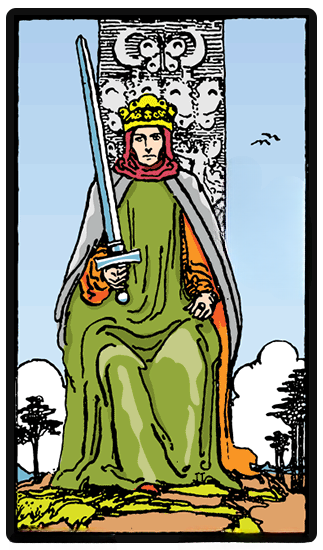 The King of Swords in reversed shows tyrannical, abusive and manipulative habits. It may indicate the misuse of one s mental power, drive, and authority. This is an illustration of persuasion and manipulation, so as to fulfill selfish desires. The King of Swords reversal meaning may also imply that you are showing off your level of intelligence by using big words when discussing ordinary topics. Another interpretation is that you may also be a loose cannon, especially where there are angry outbursts and impulses.